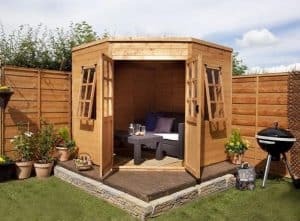 This 7 x 7 Georgian summerhouse is an attractive building that will add style and subtlety to your garden and give you many, many years of enjoyment no matter if you are using it as a place to have a few drinks with friends or as a place to relax all on your own. The unit has a generously sized double door and windows that open, so you have plenty of light and ventilation alongside easy access. The summerhouse has a great look thanks to that lovely tongue and groove cladding. This is particularly resistant to adverse weather, and is also tough enough to withstand most aspects of wear and tear. It is a protective cladding also manages to have a lot of style as well. 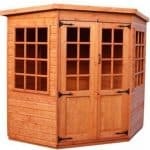 Even though this is a summerhouse that is not highly priced it is still very high quality. The tongue and groove shiplap cladding is a very impressive 12 mm thick and is supported with a very strong frame. The windows are made from shatterproof styrene so if you have children then you have no worries about broken glass being all over the place. The roof and the floor are made with some very nice looking tongue and groove boards which as well as looking attractive also are strong and long lasting. The BillyOh 5000 Georgian Corner Summerhouse is a just drop dead gorgeous summerhouse and one that really did make us say wow while we were looking at what is involved in putting this all together. We have been very impressed with BillyOh’s line of summerhouses lately and this one here with its classic Georgian design is designed to snugly fit into a corner or actually we feel that its unique corner shape would make it stand out even more if you put it in a more obvious part of your garden. While not what we would call a large summerhouse, BillyOh have still made sure that there is a nice amount of room inside here. Both the width and depth are 7 feet 2 inches which if you are a little bit crafty with how you organise your items inside can actually go very far. There is a generous amount of headroom inside here with the high point being 6 feet 7 inches and the lowest point being 6 feet 1 inch. As is the case with most summerhouses that are made to fit into a corner, this one here has a pent roof. This pent roof is just ideal as it is great from a design point of view and also in how it offers protection from the elements. 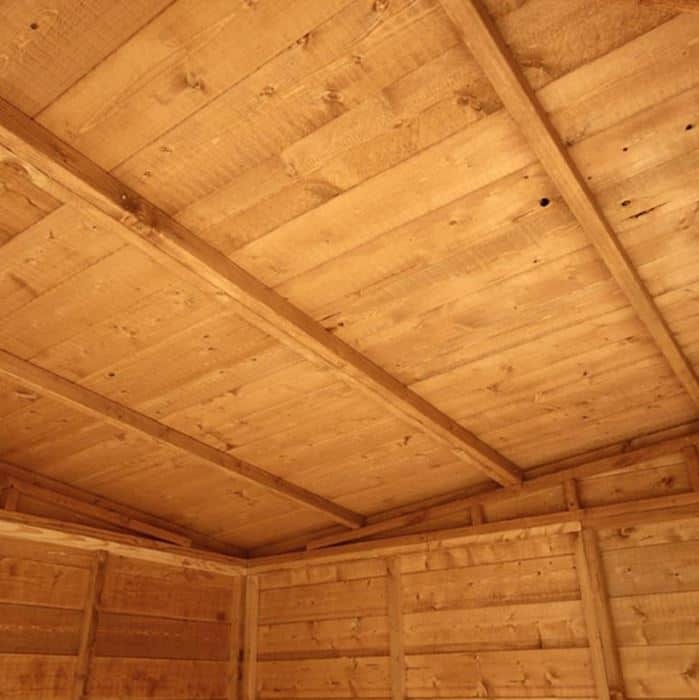 The roof is made with these lovely tongue and groove boarding which look great as you sit inside the summerhouse and these are covered with felt which while we will admit not the most exciting way to cover a roof does have an attractive look to it. The kind of cladding that they have used on here is 12 mm thick, tongue and groove shiplap cladding which we must tell you is very durable and will not allow water inside the summerhouse and that is very good, but wow does this cladding look incredible! 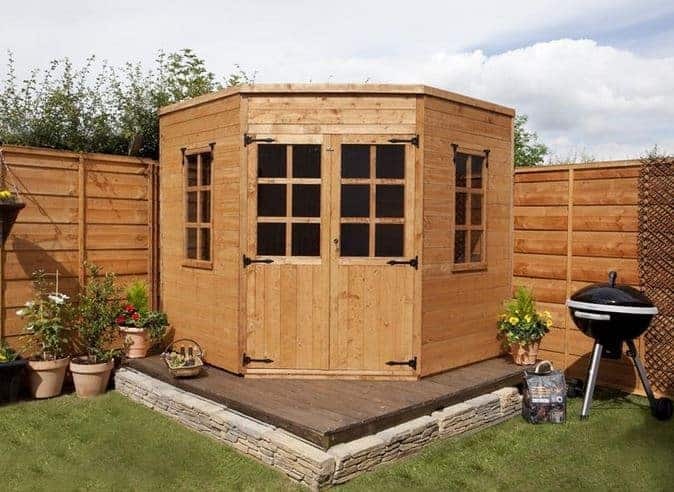 We just love the smooth look of this and how it all locks so tightly together really giving the structure the look of a little cabin rather than being a shed with just a few windows which some other summerhouses tend to do. Holding the whole summerhouse together and making this a far more sturdy and long lasting summerhouse than you may think is a 35 mm x 27 mm frame. This is some very impressive framing and it is going to keep the summerhouse standing strong for many years. We really like how BillyOh have made this frame so strong, but they have also not made it stick out too far and eat into your space inside the summerhouse. We have seen many products from BillyOh where they do not actually include a floor and you have to add one as an extra which to be honest we thought they were going to do here, but that thankfully is not the case. 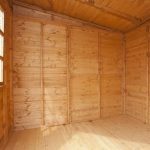 Included with this summerhouse is a high quality tongue and groove flooring which looks amazing and is also going to be able to handle a lot of weight so do not be worried about bringing in your big comfy sofa and entertainment centre. Before the summerhouse leaves the factory all of that European softwood will be given a basecoat treatment. Once installed a nice and generous coating of wood treatment should be applied to all of the wood to keep it safe from rot. If you plan on really getting your money’s worth out of this then you will want to make sure you remember to treat it on a yearly basis. 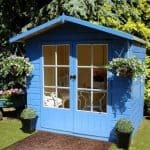 A ten year guarantee comes with this summerhouse and that is something we are very pleased with. 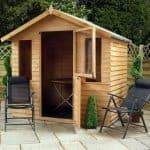 Now please make sure you treat the summerhouse as this lengthy and impressive guarantee is dependant in you treating the wood properly. One of the features we like best about the BillyOh 5000 Georgian Corner Summerhouse is the large double doors which are right on the front. First of all we want to talk about something you may not notice at first and that is those gorgeous looking and high quality door hinges. Each door is held in place with three large black hinges that have a very old timey kind of charm to them. While being attractive these hinges are also very strong and will stop the doors from sagging. Each door has a set of windows on them which will allow for plenty of natural light into the front of the summerhouse. The windows that are on the door are accompanied by a window on each side of the summerhouse. These windows can be opened so as well as fresh air, natural light is also going to be easily able to get into the structure. 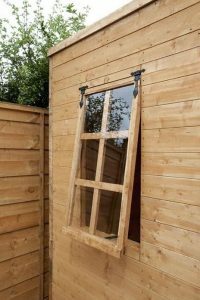 One thing we really love about these windows is that they have used the same kind of hinges that are on the door which greatly adds to the overall look of the summerhouse. Now as much as we like the way these windows look they are only made with styrene now styrene is shatterproof and a great low cost alternative to glass, but with everything else being so high quality we really wish they would have gone for glass windows, even if it did raise the price a little bit. The having a lock included is just fantastic as it saves you having to install a padlock which let’s face it as practical as it may be is a bit of an eyesore. 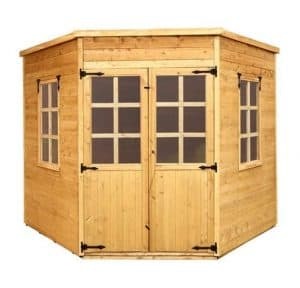 In general this is one very robust summerhouse and you will feel comfortable putting expensive items in here such as a little TV so you can watch the match or your favourite show in peace. Despite their being plenty of windows on here, the summerhouse is actually far more private than you would think. This is because these are Georgian style windows so those thick panes do make it a little more difficult for a person to have a look inside. While we really do like the way this looks in general, we are sure with the right colour this could really stand out even more. BillyOh actually offer you 12 different colours to choose from. These start at £7.95 which is for the more let’s just say basic colours such as, Dark Brown and Evergreen. They have a selection of more extravagant colours such as American Barn Red and Gunmetal Grey and these ones are priced at £24.95. There is also a selection of four different colours for the trim and all four of these are priced at £7.95. As well as the colours there are a few other extras that you may be interested in. They have a 3 feet and 4 feet set of shelves which are priced at £31.99 and £41.99. 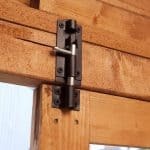 Also while we do not think this is necessary they do offer a Padlock and Hasp for £8.99 which is a low cost way to add a little more security if you want it. If you are worried about having the right tools to build this then they do have a silicone gun set for £9.90 and an assembly kit which costs £19.95. This is one very well made summerhouse and while they have made sure it is high quality it also manages to be very easy on the eyes as well. This is going to be something you can make use of for many years. The materials used have been made to last and that they certainly will. You must though remember to treat the wood in order to keep it protected from rot. 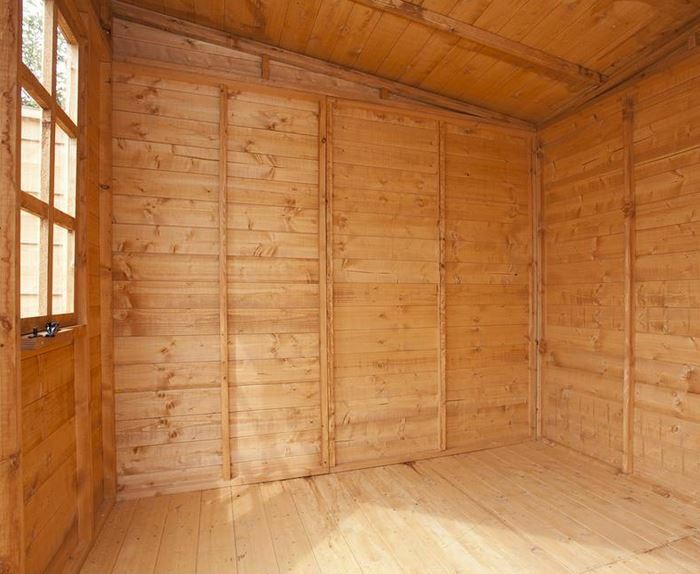 This may not be the largest summerhouse, but we feel that this kind of space can still go a very long way. 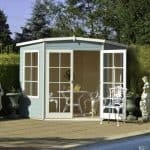 Also the more compact nature of the summerhouse will make it so even gardens that are not huge can enjoy this. The installation of this is going to take 6-8 hours and that is if you have a friend or family member helping you out. Even though it is not the largest summerhouse in the world, we still feel that this is one amazing deal. It is well made, has a very interesting look and the price we feel is very fair. 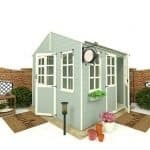 Final Thoughts: The BillyOh 5000 Georgian Corner Summerhouse is the ideal summerhouse for those of you who do not have a huge garden, do not want to spend a ton of money and who also just want a fun little place to relax. 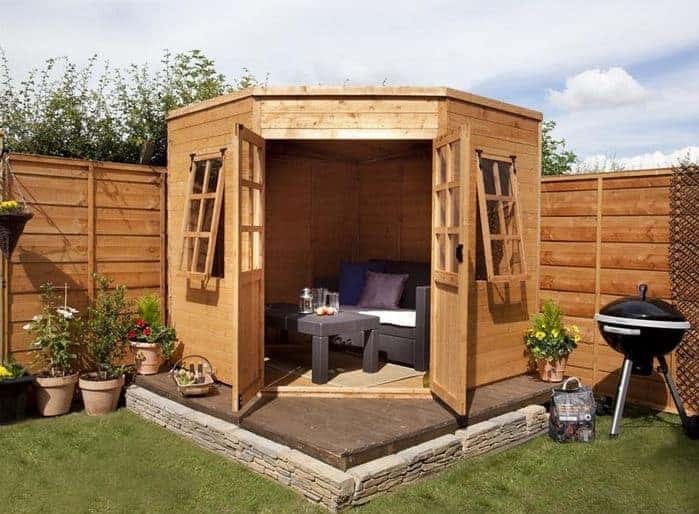 We love what BillyOh have done with this summerhouse and the design choices they have made such as the tongue and groove roof and floor, classic style hinges and just the general way this looks make it something, you will love to have in your garden. We feel that the price, considering the high quality materials used is very fair and that this is a summerhouse that should certainly be something you highly consider.